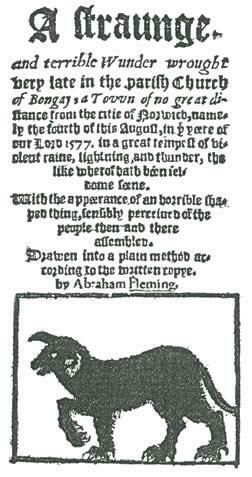 The 1577 appearance of Black Shuck in Bungay was apparently one of the inspirations for the Hound (or so it’s always claimed in Bungay). I’m getting to the point, two thirds of the way through my personal challenge to read the CWA top 100 crime books, that the remaining titles are either so obscure I haven’t seen them in four years of bookshop browsing, or so famous that probably most of you have read them already. For example, I’m sure there’s very little new that can be said about The Hound of the Baskervilles (or indeed any Sherlock Holmes story). For what it’s worth, it’s my favourite of the four Holmes novels. A Study in Scarlet and The Sign of Four come encumbered with lengthy back stories and are overloaded with Sherlock quirks (not that anybody dislikes Sherlock quirks); The Hound is content to live in the moment, and puts the story first. 1. Conan Doyle had a lovely command of eccentrics. Dr James Mortimer bursts into chapter 1 a gabbling mass of bizarre phrenological obsessions. How many people would ask for someone’s skull within five minutes of making their acquaintance? Equally barking is Mr Frankland, engaging in multiple futile law cases. Wonderfully vivid – you can almost tug on their mutton-chops. 2. It’s a shame Victorians were so Victorian. Couldn’t Sir Henry and Miss Stapleton have got together somehow? What happened to love conquering all? I expect she ended up picking oakum and/or smallpox scabs in the Baskerville Asylum for Betrayed Gentlewomen. 3. Watson is at the forefront of The Hound, and it’s good to see how someone less equipped than Holmes handles a case. And how wonderfully frank is this line, written after Holmes’ famous reappearance? A crushing weight of responsibility seemed in an instant to be lifted from my soul. That cold, incisive, ironical voice could belong to but one man in all the world. October 16th. A dull and foggy day with a drizzle of rain. The house is banked in with rolling clouds, which rise now and then to show the dreary curves of the moor, with thin, silver veins upon the sides of the hills, and the distant boulders gleaming where the light strikes upon their wet faces. Gallery | This entry was posted in Classic mystery book review, Sherlock Holmes, Witness Statements and tagged 1900s, 1902, Arthur Conan Doyle, book review, Sherlock, Sherlock Holmes. Bookmark the permalink. I actually prefer SIGN OF THE FOUR (or even SIGN OF FOUR while we are being pernickety) but this is, as you say, impossible to ignore. This is also my favourite among the 4 novels. There have been several film adaptations not only in UK and USA but also in several other countries like India, Russia and Germany. There are 2 Indian film adaptations, Jighansa (1951) in Bengali and Bees Saal Baad (1962) in Hindi. Both were super hits. Interesting – were they set in India or England? India with Indian characters in the story. This is definitely one of the top Holmes stories, I think, RIch. And I agree; it’s good to see Watson in the lead role, so to speak. Thanks for your thoughts on this. I give this book to teenage boys. And older! Watson was a writer – Holmes admired his skill. Why shouldn’t his diary be literary? And I never realised Frankland’s obsessions were utterly contradictory! Where are we going to picnic now? You’ll have to burn him in effigy, like the local villagers were planning to! I have gone through the article referred by you at the end. Hound is also my favorite of the Holmes novels. It has so much to love–from the moor scenes to Watson’s part in the story to the air of the supernatural (even though we all know it will be explained by Holmes). Great stuff!